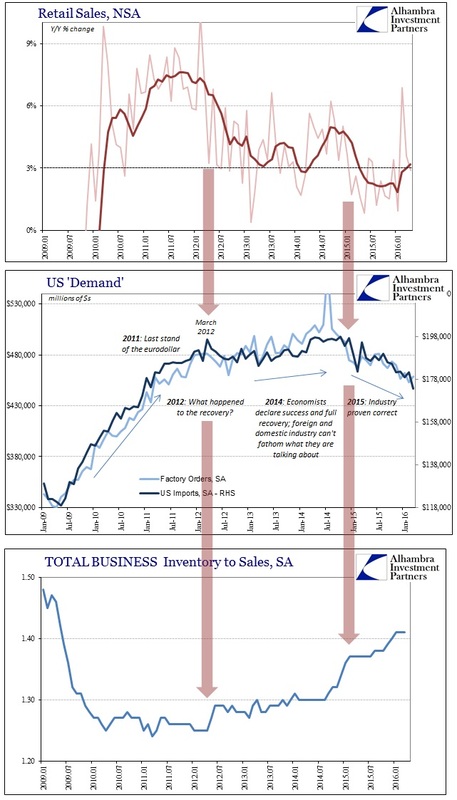 Contra Corner » Retail Sales Do Add Up—-But Not In A Good Way! Retail Sales Do Add Up----But Not In A Good Way! The calendar has been playing an outsized role in economic accounts this year, from leap year adding to February and now different months for Easter. With March entertaining the holiday this year, it seems as if seasonal adjustments might have been unduly harsh with retail sales. Into April, without Easter, seasonal adjustments may have been too charitable. Unadjusted, total retail sales in April 2016 were $450.9 billion, down $9.2 billion from $460.1 billion in March. Last year, April 2015 sales were $438.2 billion, $5.9 billion less than March 2015. Instead, the seasonal adjustments tell us that the monthly adjusted change for April 2016 was the highest since last March, which has led to the usual and predictable commentary euphoria. Sales at U.S. retailers and restaurants grew at the fastest pace in more than a year last month, a sign consumers stepped up spending after a slow start to 2016. Retail sales advanced 1.3% in April from the prior month to a seasonally adjusted $453.44 billion, the Commerce Department said Friday. It was the best monthly gain since March 2015. “Recent claims of the demise of the U.S. consumer have been greatly exaggerated,” said Capital Economics economist Steve Murphy. Economists surveyed by The Wall Street Journal had expected April sales would be increase 0.8% from the prior month. Again, the rest of the world is wondering what exactly these people are talking about. For starters, retail sales in April 2014 were only $1.4 billion less than March 2014, or almost an order of magnitude better than what we find in either 2015 or 2016. The seasonal adjustments are saying the difference is entirely due to the early holiday when there is more than enough to suspect something more than the calendar. 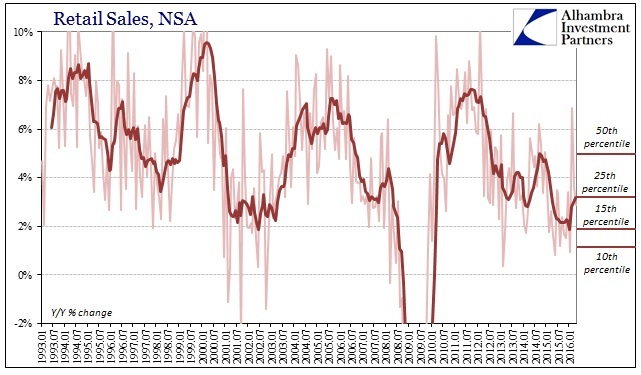 On an unadjusted basis, retail sales continue to move along below 3% or what counts as a demonstrable claim “of the demise of the US consumer.” Total retail trade, which does not count food sales, was up only 2.2% in April from April 2015, while excluding autos from the growth was just 1.92%. That may be an improvement over what happened in early 2015, but that is a very relative comparison. In other words, there isn’t as much difference between the 2.89% Y/Y gain in April 2016 as compared to the 1.58% Y/Y gain in April 2015. Last April’s low figure put it in the bottom 15% of all monthly retail sales figures, among the worst (where the lowest 10% are almost all clustered around 2009). The “improvement” to 2.89% this year puts it among the worst 25% of all months; not nearly among the worst of the worst, but still nowhere even close to the 50th percentile where “strong” or “resilient” descriptions would actually apply. What that means is exactly what you expect given a global manufacturing recession that only continues as inventory does. Last year was, essentially, a huge hole in American “demand” that with only a slight improvement so far this year does nothing to erase it. In fact, the gain is so indistinguishable that it only continues to make a deeper hole. It’s not even one step forward for two steps back, it was two steps back last year and “only” one more again so far this year. Part of this year’s “step back” has to be auto sales. 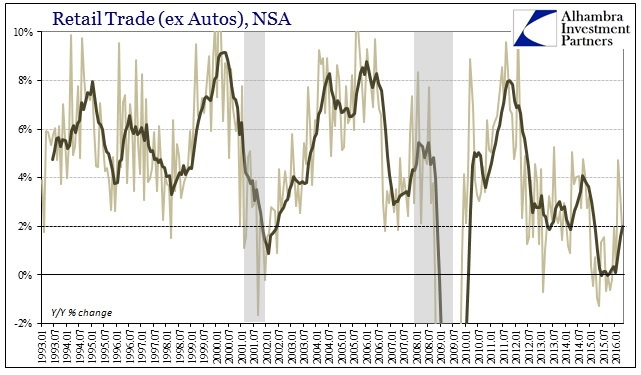 Besides jumping 12% in February, auto sales the rest of this year so far have been noticeably slower. The year-over-year gain in April was just 3.2%, not any different than the 2.9% in March, leaving the four months of 2016 combined just 4.7% more than the same four months last year. The 6-month average of 5.5%, which includes February’s 12%, is the lowest since 2009. 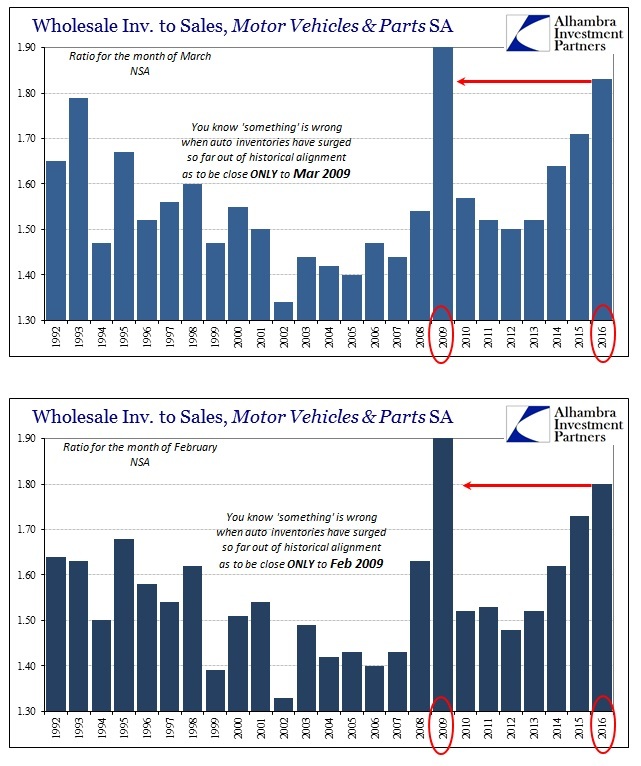 With auto inventories especially piling up at the wholesale level, this continued downtrend at the top sales level is a serious economic problem. Things went from bad to worse at Macy’s in the first quarter, with the department store giant reporting a 7.4 percent plunge in revenue as customers didn’t spend like the retailer hoped they would in key categories such as apparel. Given the dismal results and the company’s perception that shoppers remain in a cautious posture, the retailer on Wednesday cut its outlook for the full year. While it had previously said it expected a 1 percent decline in sales at stores open more than a year, it is now expecting a decline of 3.5 to 4.5 percent. The bleak start to 2016 continues a disappointing streak for Macy’s. But it also stokes fear in the wider retail industry about how much consumers will spend in the months ahead. The conventional wisdom has been that as the economy improves, shoppers will start buying gear to refresh their closets and redecorate their living rooms. And yet, despite low gas prices and a jobless rate hovering near a post-recession low, consumers just aren’t hitting the mall. “There wasn’t a lot to get excited about in our quarter,” conceded Kevin Mansell, Kohl’s Chairman and CEO in a call with analysts. Despite rising employment levels and wages in the U.S., which traditionally have been good news for retailers, Kohl’s is the latest department store to offer up a heavy dose of doom and gloom. After the close Thursday high-end department store Nordstrom delivered a stunning first-quarter earnings miss and ugly guidance reduction and saw shares tank by 15%. The company reported first-quarter earnings of 26 cents a share versus forecasts for 46 cents a share. Sales tallied $3.19 billion compared to estimates for $3.28 billion. Comparable-store sales fell 1.7%. These ugly numbers were confirmed in the retail sales report, as the Commerce Department estimated that sales at general merchandise stores were almost unchanged year-over-year and up just 1% for the first four months cumulatively. That, we are told, is just consumers spending more of their money online at Amazon and others, but the retail sales estimates for internet-based commerce gaining at the expense of “bricks and mortar” show that there just isn’t enough offset. 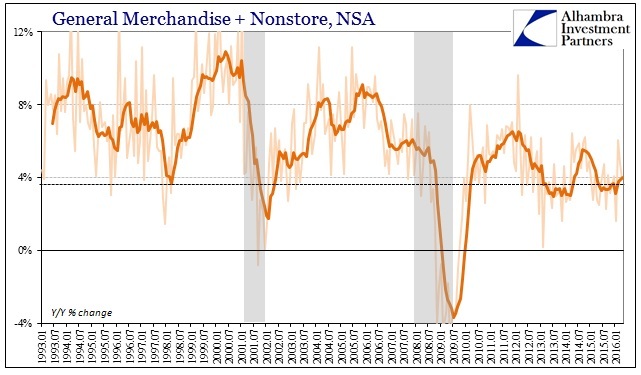 Combined general merchandise and nonstore retail sales expanded just 3.9% in April, bringing the 6-month average to just 4% – which is the same low range that has persisted (other than a curious jump in 2014) since the slowdown started toward the end of 2012. There is no consumer strength anywhere here, only more of the same slowdown weakness. 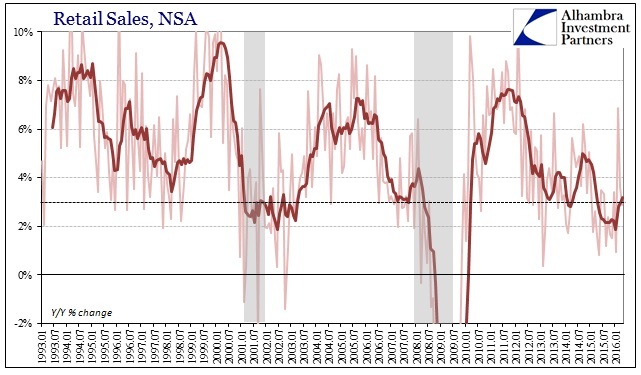 Unfortunately, the continuation of that trend only keeps up cyclical pressures and the growing possibility of having a recession within the slowdown. From sales to production with inventory in the middle, it all adds up to exactly that.